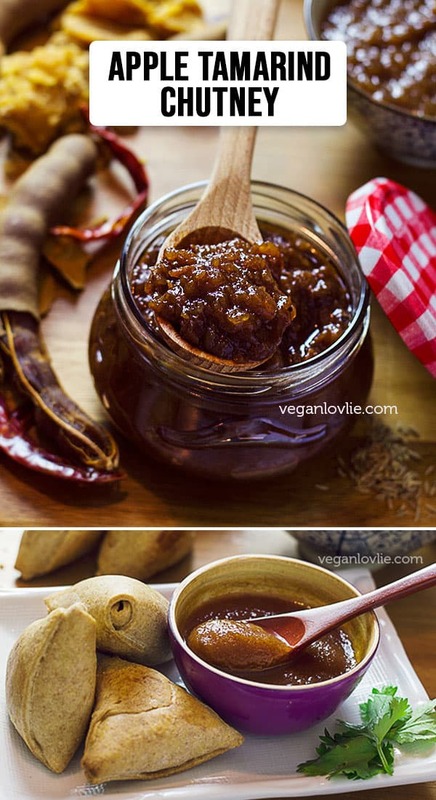 A sweet, sour and spicy apple tamarind chutney recipe filled with sun-kissed ingredients like tamarind and chillies. Fingers smeared with spicy tamarind sauce swept from the banana leaf that food is served on during Hindu and Tamil weddings or religious ceremonies — this is how I remember the spicy tamarind compote. 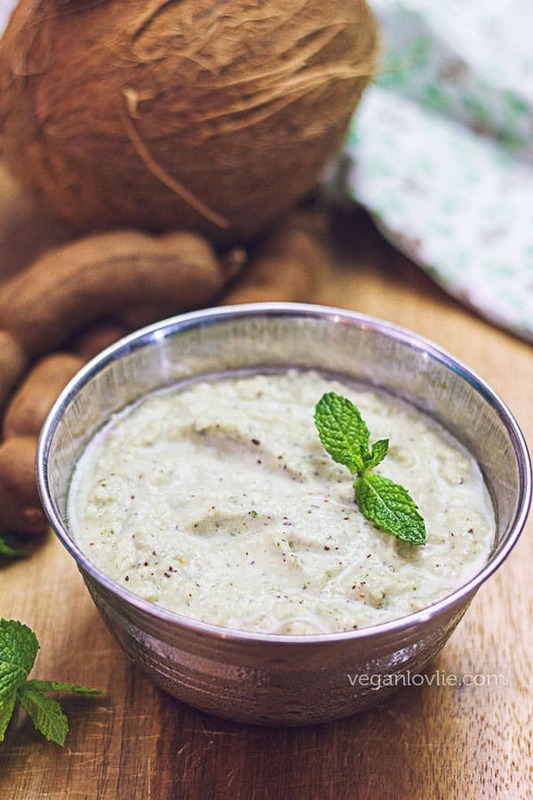 Locally known as ‘takkar’ in Mauritius, this particular compote is traditionally served as dessert as part of a ‘sept cari’ (meaning seven curries) meal. Relished by young and old alike, takkar is one of those treats that leave one with that feeling of contentment after a satisfying 7-curry meal. 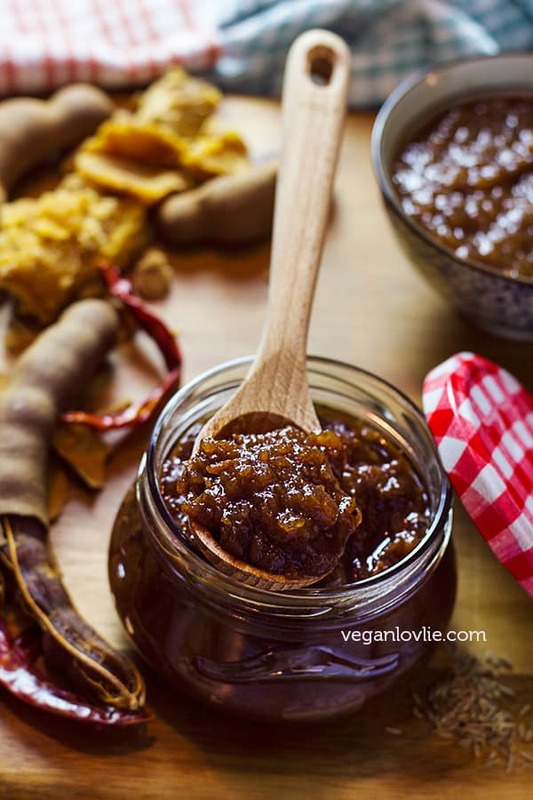 I drew inspiration from culinary traditions for this Apple Tamarind Chutney, filled with sun-kissed ingredients like tamarind and chillies. 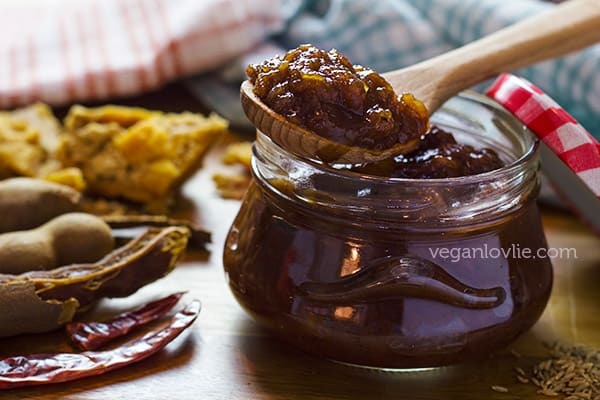 The slow simmering gently builds layers of rich, sweet-sour-spicy flavours while whole cumin seeds add flecks of earthy, nutty and somewhat bitter undertones lending a penetrating aroma to this chutney. Crunchy yet discreet, whole cumin seeds add that touch of complexity to the texture and distinctly sharper flavour that you will not get from ground cumin. A pinch is just enough, so do not go overboard with whole cumin. 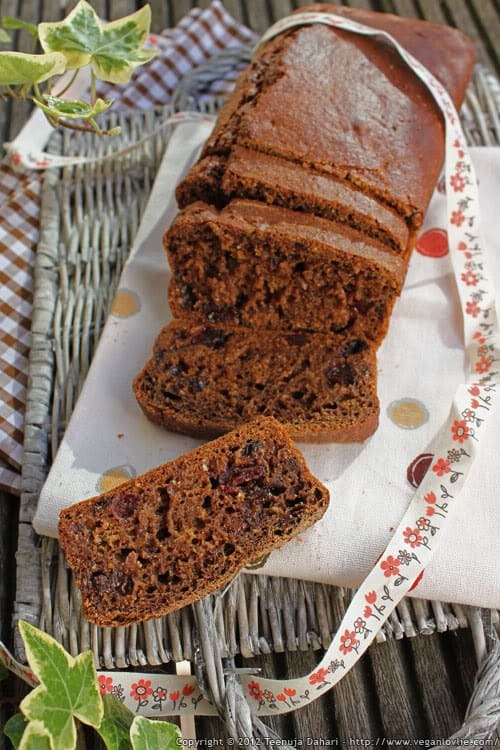 Dates and apples contribute some natural sweetness in this rendition but some sugar is required for good measure to counteract the sourness of the tamarind. 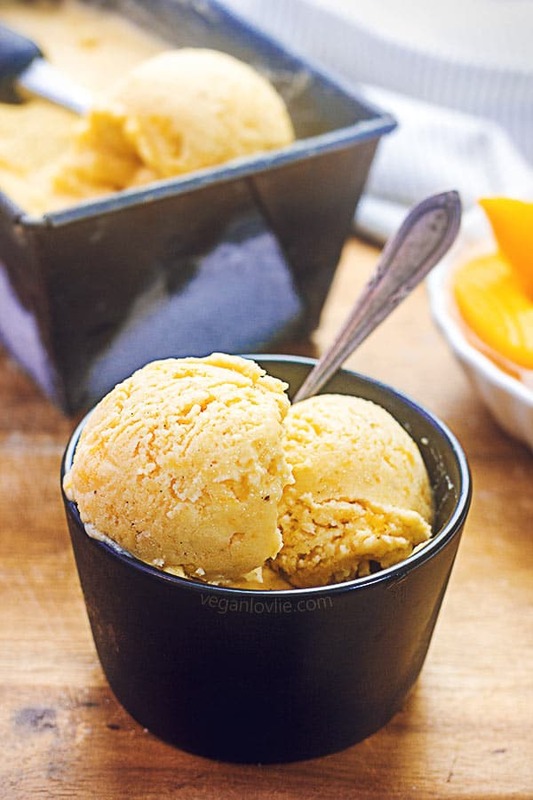 For its depth and earthiness, jaggery is my preferred sugar in this recipe. Widely consumed in Asia and Africa, jaggery is a traditional unrefined sugar made either from cane juice or the sap of the date palm tree. The latter results in what is also known as palm sugar. After the cane juice or palm sap is extracted and boiled down to a thick syrup, it is then poured into small containers and allowed to cool. Upon cooling, the jaggery becomes a soft solid and it is then pressed into smaller vessels of various sizes and shapes. Because of the traditional way of making this sugar, the colour of jaggery varies from golden brown to dark brown due to the presence of the molasses. This not only gives jaggery its rich intense flavour but it also means that a lot of minerals are still present; this makes a healthier alternative to refined sugar. Watch the video for the easy process of making this chutney. *Paprika will give the chutney a nice warm reddish brown hue. Place the tamarind pulp in a bowl and cover with the hot water. Leave aside to soak. Meanwhile, pit the dates if they are not pitted. Cut them into small pieces. 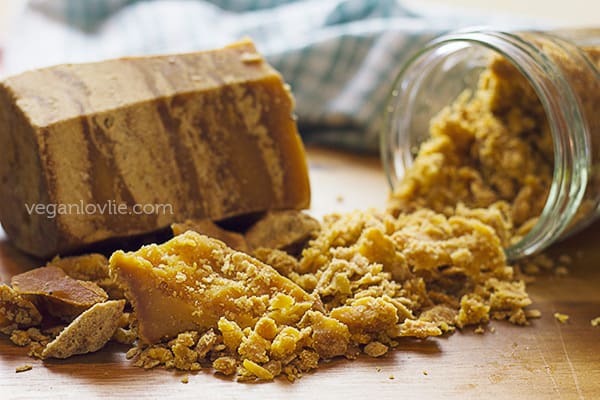 Scrape the jaggery block or chop (or grate) it into fine crumbs. Peel and core the apples. Then grate or finely chop them. By now the tamarind should be soft enough and the water cool enough. Go in with your fingers and smoosh the tamarind in the water to break the pulp. As the pulp dissolves into the water, the seeds will be separated. Either scoop out the seeds with your hand or use a sieve and pass the tamarind juice through it. Press the seeds and unwanted fibres to extract the maximum amount of juice. Keep the tamarind juice aside for now. (Check out this video on how to deseed and prepare tamarind pulp). Heat a pan on medium temperature. Add in the cumin seeds and roast for one minute. If using ground cumin, only roast for about 20 seconds. 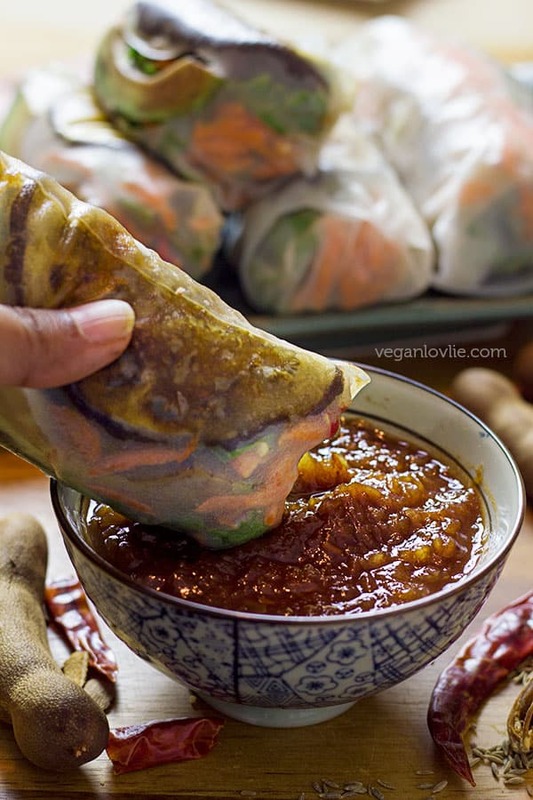 Pour in the tamarind juice followed by all the rest of the ingredients. Stir and mix everything together well. Then cover and simmer for about 45 minutes or until the apples have melted into the sauce. Occasionally add more water as needed to continue cooking the sauce and avoid it from burning. You may cook the sauce for less time if you like some bits of apple to remain whole. Taste and adjust the sugar or chilli depending on how you like it. Allow to cool and transfer into a jar. Keep refrigerated for up to a month. Serve with snacks or as an alternative to bbq sauce or other marinade. Depending on how you intend to use the sauce, you may also process this chutney in a blender with a little water to produce a smooth sauce. 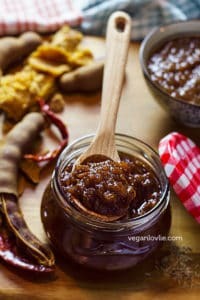 Aside a dipping sauce, this chutney can be used in various ways — as alternative to barbecue sauce or as a sauce base in stir fries. Stay tuned to see what else we use this sauce for. 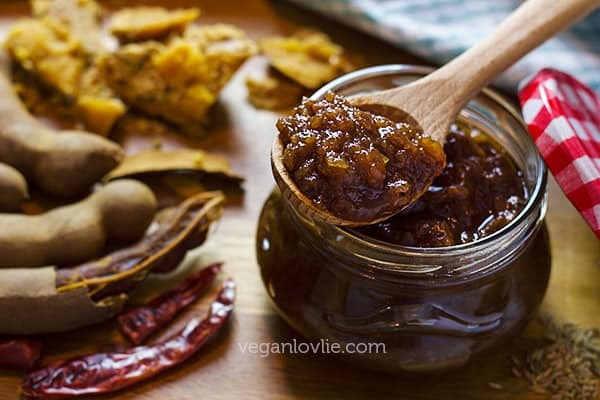 A sweet, sour and spicy chutney made with apple, tamarind and chilli. 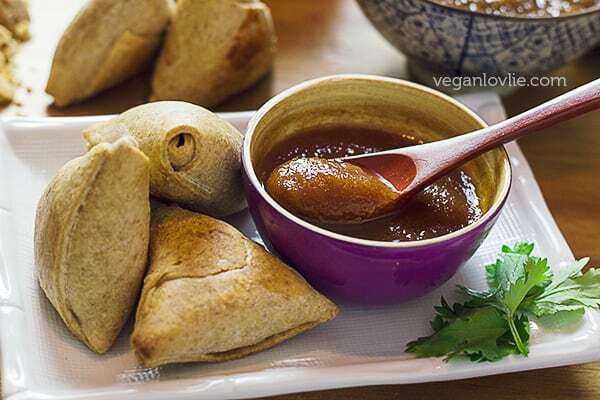 Great as an accompaniment to meals or as a dipping sauce. By now the tamarind should be soft enough and the water cool enough. Go in with your fingers and smoosh the tamarind in the water to break the pulp. As the pulp dissolves into the water, the seeds will be separated. Either scoop out the seeds with your hand or use a sieve and pass the tamarind juice through it. Press the seeds and unwanted fibres to extract the maximum amount of juice. Keep the tamarind juice aside for now. (Check out our video on how to deseed and prepare tamarind pulp). Pin this recipe for later. And while you’re on Pinterest, come follow us and pin along with us.